This is a scalable context timeline. 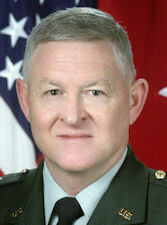 It contains events related to the event (Between 8:49 a.m. and 9:02 a.m.) September 11, 2001: Army Vice Chief of Staff Keane Orders that His Operations Center Be Fully Manned. You can narrow or broaden the context of this timeline by adjusting the zoom level. The lower the scale, the more relevant the items on average will be, while the higher the scale, the less relevant the items, on average, will be. General John Keane, vice chief of staff of the Army, talks on the phone with Major General Peter Chiarelli, the Army’s director of operations, readiness, and mobilization, about a suspicious plane that is approaching Washington, DC, and the two men discuss evacuating buildings in the capital, including the Pentagon. Keane called Chiarelli from his office at the Pentagon after he learned a plane had crashed into the World Trade Center and instructed him to bring the Army Operations Center (AOC) at the Pentagon up to full manning (see (Between 8:49 a.m. and 9:02 a.m.) September 11, 2001). General John Keane, vice chief of staff of the Army, initially goes to assist people near the crash site after the Pentagon is hit but subsequently goes to the Army Operations Center (AOC) in the basement of the Pentagon to help the military respond to the terrorist attacks. 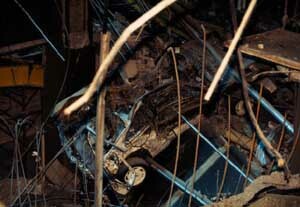 Keane ordered Major General Peter Chiarelli, the Army’s director of operations, readiness, and mobilization, to bring the AOC up to full manning after he learned a plane had crashed into the World Trade Center (see (Between 8:49 a.m. and 9:02 a.m.) September 11, 2001). [Fordham News, 9/10/2016; Weekly Standard, 9/11/2016] The AOC is “the Army’s command and control center,” according to Chiarelli. [Soldiers, 9/2004] It is “the place that people will migrate” to during an emergency, according to Brigadier General Clyde Vaughn, the Army’s deputy director of operations, readiness, and mobilization. 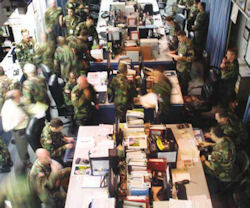 [US Army Center of Military History, 2/12/2002] And yet Keane did not go there himself in response to the attacks on the WTC and was still in his office when the Pentagon was hit. Although his office is located far away from where the attack occurred, it shook violently from the impact and subsequently started filling with smoke. Keane Tells His Staffers to Go Home - Following the attack, Keane tells his immediate staff to call home and then evacuate. “Look, call your homes right now and make sure everybody knows you’re alright,” he says, “and then I want you to all to leave the building immediately.” He keeps just his executive officer and his aide with him, and decides to head to the scene of the attack. “Let’s go on down there and see if we can help some of these people,” he says. Keane and his colleagues grab some T-shirts, soak them in water, and wrap them around their noses and mouths for protection. They then make their way toward the crash site.